The Montreal Canadiens delivered on one of the biggest opening round upsets in NHL history, by not only defeating the Washington Capitals, but by coming back from a three games to one deficit. During that series Montreal lost one of their top defenders in Jaroslav Spacek. After Spacek's injury, the Habs recalled P.K. Subban from their AHL contender, Hamilton. Subban has had a cup of coffee in the NHL, but entering into the NHL playoffs against the league's top team, was sure to be a baptism by fire for any rookie. 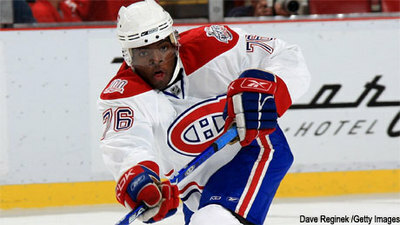 Although a very highly touted prospect, Subban would be subjected to a very watchful eye. Subban began by playing fairly significant minutes, and was part of an incredibly stingy defensive corps that held the likes of Ovechkin, Semin, Green, Backstrom, etc... to a single goal in each game he played. After advancing, the Montreal blueline was dealt yet another heavy blow, when their top defenseman, Andrei Markov was hurt. Subban had performed admirably against the Caps, and would see his role increase again, against the defending Stanley Cup champion, Pittsburgh. How has P.K. Subban responded during his trial? In 5 games, he is averaging more than 17 minutes per game, has contributed 1 goal and 3 assists, and has an even +/- ratio, which has only been bettered by the Habs "shutdown" pair of Gill and Gorges. In short, not only has he performed, statistically, as well as any of the veteran defenders, he has been counted on to contribute in all zones and on special teams, including the penalty kill unit. He may only be a rookie, but you would never know by the way he has played with so much at stake. 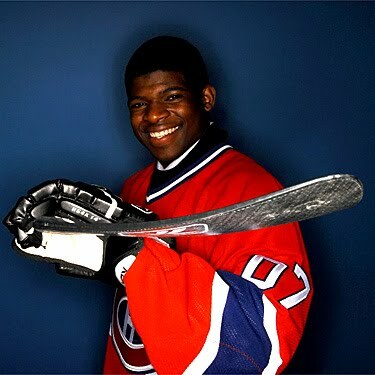 Well done Mr. Subban. Well done. Nous sommes tous très impressionnés, en effet!